Blizzard has released World of Warcraft: Legion patch 7.1 on the Public Test Realm (PTR), which reintroduces Karazhan as a 5-man dungeon. 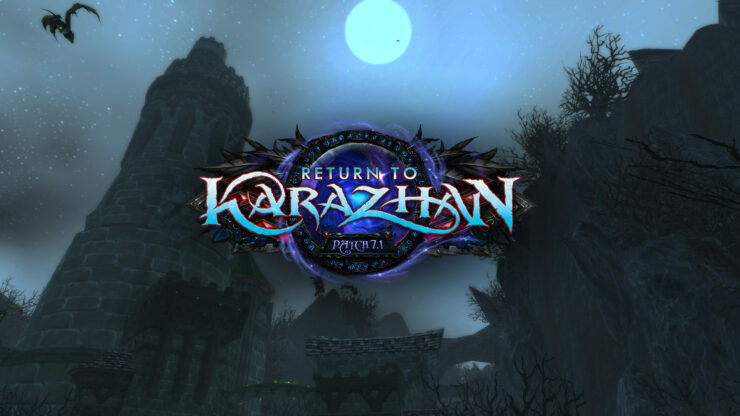 Legion’s first patch, titled “Return to Karazhan”, was announced by Blizzard at this year’s Gamescom. The patch brings back the 10-man Karazhan raid from “The Burning Crusade” expansion as a large 5-man dungeon with all 9 bosses. Blizzard later provided additional details on the first patch for the Legion expansion. While the official patch notes for patch 7.1 have not yet appeared on Blizzard’s official WoW: Legion website, the changes were listed in the World of Warcraft launcher. Apart from the new Karazhan dungeon, new world quests, and a new world event area have been added. Additionally, a large number of class and leveling changes have been made. New attunement questline in Deadwing Pass. Short questline leading into the raid. New World Quests: Kvaldir landing sites. New Nightfallen story quests, with new content every week leading up to the opening of The Nighthold. New World Quests supporting the continued Nightfallen story. Falcosaurs Swarm! – The coastline of the Broken Isles is under assault from an invasive, predatory species, and they’re breeding out of control! Falcosaurs drop Falcosaur Eggs and Falcosaur Feathers, reagents for new First Aid and Cooking recipes available from the Wardens faction at Honored and Revered. Find and raise your Orphaned Falcosaur pet, leading to an exclusive new mount. (Balance, Guardian, Feral) Druids now have Regrowth in place of Healing Touch. Incarnation: Chosen of Elune once a gain provides the armored Moonkin model. Now has a power aura. (Frost) Brain Freeze now also increases the damage of your next Flurry by 30%. Holy Wrath now deal 200% of your missing health in damage to 4 nearby enemies, up to 120% of your maximum health. Crusade has been redesigned: Replaces Avenging Wrath. (Instant – 2 minute cooldown) Profoundly empowers your Judgment for 20 seconds. While empowered, Judgment generates 1 Holy Power, has a 75% reduced cooldown, and increases your damage and healing by 3%, stacking up to 15 times. Bastion of Light now has a 2 minute cooldown (was 3 minutes). (Shadow) Arcane Torrent now generates 15 Insanity. Unstable Affliction now overlaps when cast multiple times, rather than “rolling” any remaining damage into the new cast. This does not change the total damage dealt by multiple casts, but makes it easier for players to see the strength of an Unstable Affliction on a given target. (Affliction) Soul Effigy is now immune to AOE damage. (Demonology) Demonic Empowerment now increases health by 20% (was 50%). (Demonology) Thal’kiel’s Consumption deals damage equal to 8% of pet health (was 6%). The quality of items rewarded from skirmish and random battlegrounds now increases based on the player’s Honor Level. The World of Wacraft Legion expansion was received amazingly well among the WoW community, and upon release, the expansion sold 3.3 million copies on its first day, thereby matching the all-time record achieved by previous expansions.